Cycling fans from Bridlington will have two chances to see some of the world's top cyclists without travelling far next year. Stage three of the Tour de Yorkshire will go from Bridlington to Scarborough on Saturday, May 4. The start of the 2017 Tour de Yorkshire race in Bridlington. But the first day of the race goes from Doncaster to Selby and will pass through large parts of the East Riding. The riders will pass through Skidby, Little Weighton, Walkington, Beverley, Leconfield, Middleton-on-the-Wolds, North Dalton, Pocklington, Barmby Moor and Sutton upon Derwent. 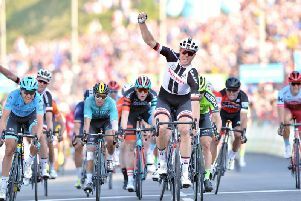 The Tour de Yorkshire will then return to the East Riding on the Saturday, with the start of both the women’s and men’s races taking place outside Bridlington Spa before the riders cycle 132km in and around North Yorkshire before finishing in Scarborough. Cllr Stephen Parnaby OBE, leader of East Riding of Yorkshire Council, said: “Today’s route announcement for the 2019 Tour de Yorkshire is fantastic news for the East Riding, with our area getting not just one but two days of racing. “It is really exciting to see so many new locations on the route for next year and will give even more of our residents the chance to see some of the world’s top cyclists competing right on their doorstep. “With the event growing in popularity year-on-year, I am sure communities will again get right into the spirit of things, decorate their towns and villages and line the streets to cheer on the riders. “The race gives us the chance to showcase the East Riding to audiences both at home and abroad and to put it on the map as a must-visit destination.